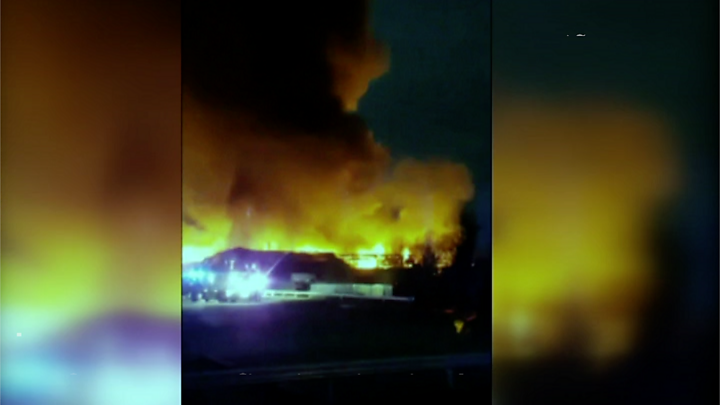 A large fire has destroyed a garden furniture factory in Birmingham. The blaze at Dreams Living in Hay Hall Road, Tyseley, broke out on Monday morning. West Midlands Fire Service said about 100 firefighters tackled the fire at its height, and officers were investigating its cause. Some Dreams Living customers were told their deliveries had been cancelled. The company has been contacted for comment. Incident commander Neil Griffiths said firefighters had stopped the blaze spreading to surrounding businesses. "Sadly the building is totally destroyed," he added and that crews could have done nothing more to save it given the fire's severity. Customers later received a text from Dreams Living apologising for disruption to deliveries. Residents were advised to keep windows and doors closed as a precautionary measure. Roads in the area were also closed and rail services disrupted. The Environment Agency tweeted that it was on the site to "ensure any impact on the local environment is minimised".